The most widely read publication in the information industry, this is the only newsmagazine designed to meet the needs of the information professional. 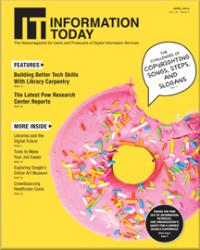 Information Today delivers total coverage of late-breaking news and long-term trends in the information industry. Accurate, timely news articles inform the reader of the people, products, services, and events that impact the industry, while hard-hitting, topical articles explain significant developments in the field.